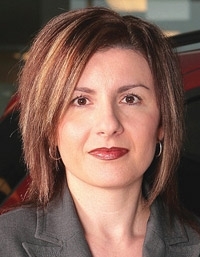 Maria Soklis is second in command at Kia Canada. For the first time, a woman has joined the senior executive ranks at Kia Motors. She is 40-year-old Maria Soklis, who was named vice president and COO of Kia Canada. Soklis worked for 10 years with General Motors in Europe and Canada in manufacturing and sales posts. The Canada native left GM in 2006 for a less demanding job as a regional field representative at Kia Canada so she could spend time with her family. But the promotions kept coming -- including acting national sales manager, national sales manager and director of sales. "They kept giving me additional responsibilities but said I could be flexible with my kids," she says. Since arriving at Kia, Soklis has focused on sales and customer service training programs for the brand's 155 dealers. She enacted Kia's first dealership redesign program, which must be completed by the end of the year. Soklis says 87 percent of the dealers have signed up for the program, for which Kia provides supporting funds. Soklis brought a version of the Hyundai Assurance program to Canada. Under the program, Kia promises to buy back a car if a customer loses a job within a year. Kia's sales in Canada grew 26.9 percent from 2006 to 2008, to 37,520 units. Through April of this year, Kia sales were up 9.2 percent to 11,877 units. Soklis is No. 2 at Kia Canada in Mississauga, Ontario. She reports to CEO Jay Chung.